place « CONSTABLE RESEARCH B.V. When you lend somebody something you assume he (or she) will give the item back in due time. To lend you have to Trust somebody. There are many ways to create a trusted relation. When a long term trusted relationship grows out of a long chain of interactions the Iterated Prisoners Dilemma is at stake. The Chinese are the Masters of Playing this Game. In some situations it is very clear that a try-out is not necessary. If we look at the cultures of the Earth we can see that the concept of Family or Tribe more or less guaranties a trustful relationship. In a Family it is not needed to create very complicated arrangements like contracts, procedures, laws and judges. The Family uses it own rules. The consequence of the Concept of the Family and the Tribe is a formalization of relationships based on a Place in a Hierarchy. Everybody has to know its place. A King has to play the role of the King and a Father has to play the role of the Father. In a Family or an Extended Family (Tribe) you are trained to play the roles you have to play in your life. Confucius (551-479 BC) saw the universe and all living things in it as a manifestation of a unifying force called the Doe (translated as the Truth, Unity, or the Way). Doe constitutes the very essence, basis, and unit of life that perpetuates order, goodness, and righteousness. It manifests itself in the harmonious opposition of yin (“feminine, gentle“) and yang (“masculine, strong“), and in humans through duk (“virtue“). Virtue is a gift received from Heaven. It is through Virtue that a person is able to know the Heavenly Truth and it is the “locus where Heaven and I meet“. Virtue can be realized through self-cultivation. It provides the fundamental source of insight and strength to rule peacefully and harmoniously within oneself, one’s family, one’s nation, and the world. There are two inter-related aspects of virtue: in (“Human-hearted-ness“) and ui (“Rightness“). The basis of individual and humanity is the Human-heartedness. Human-heartedness is essentially relational and it involves loving, sacrificing and taking care of others. Individuals are born with Human-heartedness and experience Human-heartedness through the sacrifice and devotion of their parents. The second concept, ui (“rightness“), notes that an individual is born into a particular family with a particular status. Rightness articulates that individuals must perform and fulfil their duties as defined by their particular status and role. Confucius considered family and society to be hierarchically ordered, necessitating that everyone fulfil their duties. Fulfilling one’s given role as a father, mother, child, elder, teacher, or politician is considered a moral imperative and not a matter of personal choice. Confucius considered society to be socially ordered and that each person has beun (“portion or place“) in life. Each beun had attached roles and duties, and each person must fulfil these roles and duties. Duties and obligations of each beun are prescribed by yea (“propriety“). Propriety articulates expectations, duties, and behavior of each individual according to his or her status and role. For example, chemyon (“social face“) need to be maintained by a person of social stature defined by his or status, regardless of his or her personal preference. Social order and harmony are preserved when people observe their place in society and fulfil their required obligations and duties. The fourth concept is ji (“knowledge“). Knowledge allows us to understand the virtues of Human-heartedness and Rightness and to follow these virtues through Propriety. It is the basis of the development of Wisdom. By the applying the principles of Confucius Chinese Society became a Well Oiled Machine. Every action that was taken was pre-programmed by all levels of education. Every part in the machine knew its role. Life was highly predictable and everybody accepted its place in Society. There was Harmony and Peace in the world. If there be beauty in character, there will be harmony in the home. If there be harmony in the home, there will be order in the nation. If there be order in the nation, there will be peace in the world. The big changes of Chinese Society came Out of the West. The English Empire destroyed the Heavenly Order by selling large quantities of Opium. The huge underclass of China was a beautiful target for the people who followed the theories of Lenin. The Upperclass was destroyed and a new Upperclass, The Communist Party, took over. The culture of China has not changed. People still know their place and the Doe (The Way It Is) is now proclaimed by the Party. The new upperclass knows it has to keep the underclass in harmony. The Party decided to create a higher standard of living by importing capitalistic principles from the West. It is now moving in high speed to the level of the Consumer Society. The West is paying for this move by buying Chinese products for a very low price. In this way China has accumulated an enormous amount of money (mostly dollars). They are able to buy what they want. With the enormouss stock of dollars they are able to manipulate US Government. China is able to destroy the US Financial System in one fast move. They certainly will not do that. The Chinese people are experts in strategy. They know how to acquire power without fighting. They keep a social face and play the game others want them to play. They are experts in applying the Iterated Prisoners Dilemma. They know Confucius and his predecessors were Wise man. They knew how to move with The Cycle, the Tao. Western Society has lost its cultural foundation. The principles of Confucius don’t sound very strange to us. They are easily translated into Christianity. When the West lost the basic principle of Christianity, Human-hearted-ness (in) one of the two pillars of Trust was lost. The West rationalized Empathy (Compassion, Emotion). I Think, therefore I Am (Descartes) became the basis of the Self. When people started to do the “wrong thing” the second pillar of Trust, Integrity (ui, Rightness) dropped. Politicians were not Playing the Role of the Politician and Managers were not Playing the Role of Manager. They lost their Virtue. Finally the Doe (Unity) of Western Society was gone. Families broke up. Everybody was Left on its Own and started to act on a Short-Term Perspective. The Interated Prisoners Dilemma changed into a chain of disconnected attempts to leave the Prison. The best way to win such a Game is to defect. You always win but your victory is never a Win-Win. On the long term Everybody changes into a potential Enemy. The West entered the State of Individualism and even Egoism. In this state it is almost impossible to act out of Unity. Everybody is going its Own Way or is Competing with the Other. This makes it even easier for the Chinese Masters to create a new Machine to support their Extended Family. The Tree of Life is a concept that can be found in almost every culture. The Tree of Life describes the Process of Creation. Let’s begin with Egypt. The Tree of Life is constructed out of nine entities. That’s why the tree of life is called Pesedjet (Nine) later translated in Ennead. The top of the tree is called Atum. Atum masturbated and gives birth to two children called Shu (Air) and Tefnut (Moisture). Shu and Tefnut give birth to Geb (Earth) and Nut (Sky). 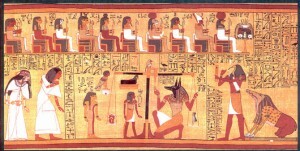 Geb and Nut produce four children Isis, Nephthys, Osiris, and Set. The sequence of the process of birth of all the deities generates a structure. The first step is a triangle. The second step is a square and the last step is also a square. If we connect all the stages a patterns of 22 connections emerges that is visible in all the other trees of life. 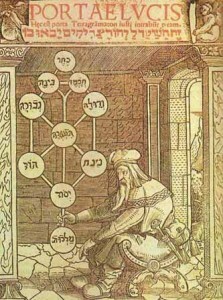 The Jewish tree of life is strongly related to the Kabbalah. The Kabbalah originated in the middle ages (the 12th Century) but the source of the Kabbalah is much older. Perhaps it originated in Egypt when Ra-Moses moved the priests of Aten (inspired by Ra) to the Holy Land. The top of the structure in the Kabbalah is called Keter (Crown), “the most hidden of all hidden things“. The concept of the Keter has a lot in common with the concept of Atum. Atum and Kether are both “self-reproducing structures”. 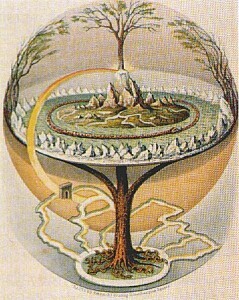 In the Yggdrasil the top is called Asgard. It is the place where Odin(Ygg) lives. Asgard contains Walhalla (“heaven“). At the bottum of the tree we find Hel located in Niflheim. Midgard or Middle Earth, the world of mortals, is located in the middle. It is very clear that the story of the Yggdrasil contains many distortions caused by influences of Christianity (Hell) and many authors who gave their “artistic interpretations” without knowing the “old” foundation. The Axis Mundi is perhaps the oldest representation of the Tree of Life. It is represented by a mountain (Mount Meru, Mount Olympus) surrounded by other “impressive” structures of nature. Meru has a lot in common with the Old Continent of Mu. Many stories that are connected with the Tree of Life tell about the disaster of the Great Flood and predict a comparable end of the world (the Gotdammerung). It is very clear that many stories are “mixed up”. The story of Mu and Atlantis are mixed up with the knowlegde about the origin of creation (the self-reference that is closed in itself), interference of the Church of Rome (Heaven and Hell), the creative power of poets and old knowlegde of the Sacred Geometry of Life. The Kabbalah and especially the Zohar contains (in my opinion) one of the purest representations of first stage (the Triangle) of the Tree of Life. Read this poem and you know everything you have to know! It is about the Ein Sof, The Primal Void. In the middle center of the endless emptiness…..